The file name of the current year is taken from the cell named "File0" . The cell File0 contains a function =BFileName(DisableConnection). This function checks if the file is open in Banana. If the file is not open the content of the cell is set to an empty string. The other Banana Sync functions will not make any call to Banana, to retrive data. If the file is open it will insert the name of the file. The cell B6 contain the name of the file to be used. Insert the file name in cell B6. The file name of the last year is taken from the cell named "File1" . An empty string. The start and end date of the accounting are used. In order to create a period from two Excel dates use the function BCreatePeriod. With the abbreviation you can easily use the same spreadsheet for accounting file of different periods. M + the month number M1, M2, .. The function is the same but end with "F"
Retrieve the account description of the specified account or group. With argument column you can indicate to retrieve another column instead of the Description column. Retrieve the normalized amount based on the BClass. Only work for double entry accounting only. For Income and expenses accounting use BBalance or BTotal. for accounts of BClass 1 or 2 it return the balance (value at a specific instant). for accounts of BClass 3 or 4 it return the total (value for the duration). For accounts of BClass 2 and 4 the amount is inverted. You can use this functions also with groups provided you assign a BClass also to a group. Enter the accounts numbers separated by the character “|” ("1000|1001). You can specify normal accounts, cost centers or segments. You can also use wild cards and also use “Gr=” followed by the accounting group. Same as BAmount but use the budget data instead of the accounting data. Same as BBalance but use the budget data instead of the accounting data. Same as BInterest but use the budget data instead of the accounting data. Same as the BOpening but use the budget data instead of the accounting data. Same as the BTotal but use the budget data instead of the accounting data. Retrieve the content of a table cell as an amount. Retrieve the content of a table cell as a text. Convert an Iso Date to an Excel date. Return the FileName or an empty string if there is no connection with the web server or if the file is not correct. If the value of disableConnection is not void the function returns an empty string. Use the cells that contain the result of this function as the file name parameter when using the other functions. If Banana is not open only one query is made and Excel will not wait for a long time. Return the version of the function in the date format. Retrieve information regarding the file properties. Retrieve the Balance for balance of period start for the indicated account. Return the result of a free defined query. Retrieve the movement for the period. Should be used to retrieve the data for the Profit and Loss accounts (Cost and Revenues). Return a value regarding the specified VatCode (or multiple VatCodes). The content of a cell, useful for text. The content of a cell is converted to a number so that you can use it for calculation. With this you will retrive the exact content of a column "Balance" for the row where Account is 1000. If the Balance is credit the amount is negative. You have different formula that allow to retrieve the amount. This is equivalent to the above. It retrieve the Balance of the whole accounting period. But BBalance allow you to use also a period. As a period you can use the date being, date end of an abbreviation. M3 means the first month of the accounting period. If you use abbreviation instead of date your sheet will automatically adapt to file of different year. It retrieve the total movement (Debit - Credit) for the period. Use BTotal to the amount for income and expenss account. Cedit amounts are retrieved as negative numbers. BAmount put the sign in positive based on the BClass of the account. The amount retrieved depend on the BClass of the account or the group. For Balance accounts (bclass 1 and 1) retrieve the Balance. For Income and expenses accounts (bclass 3 and 4) retrieve the Total. It also invert the sign in case of BClass 2 and 4. 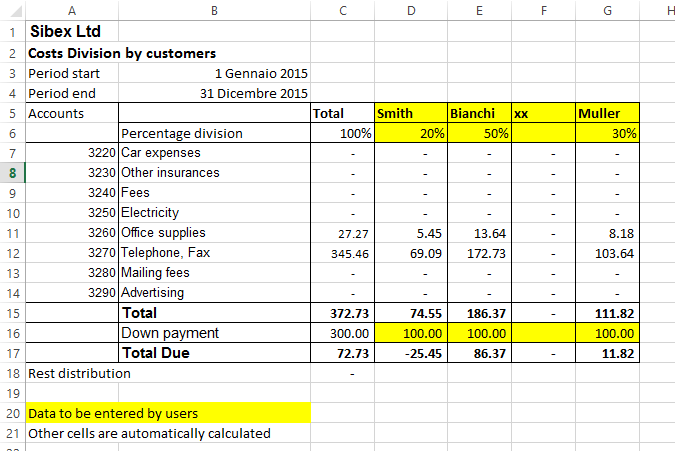 So if you use BAmount for the Account revenues (BClass 4) you will have the total sales for the period in positive. Your are free to use the most appropriate function. It is the same as GetCellValue but it deal automatically with accounts or groups. Is usefull to retrieve the description of an account or group, in combination with BBalance, BTotal or BAmount. The automatic recalculation does not update the data from the accounting file. The example files contain a button “Recalculate” that call the macro RecalculateAll. Functions are defined in the Visual Basic module “Banana”. If you add your function it would be better to add to your module. To access the Visual Basic Macro Functionalities you should activate the macro. In order to see and edit the functions your nedd to show the Developer tab in the Excel ribbon. Copy the content of the "BananaSync.xmls - Banana (Code)"
Paste the content in the Modules->Banana of your file. Banana ExcelSync functions have been tested with Excel 2013 and 2016 for Windows. Excel for Mac is not ready yet. In Excel for Mac is not possible to call the http. Any contribute to solve this problem is welcome.